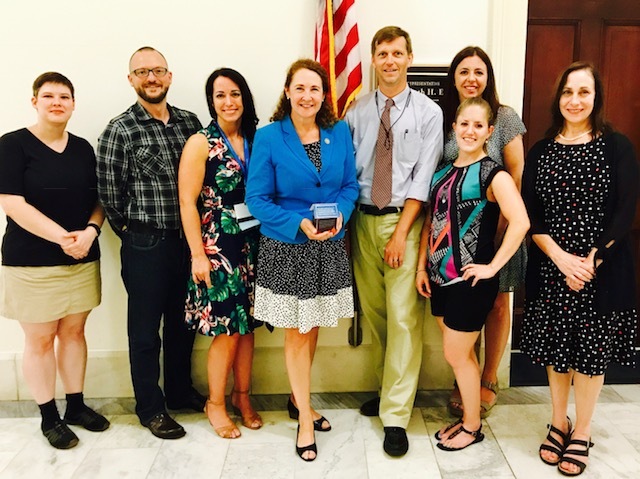 On Wednesday, July 19th Connecticut providers held meetings with Connecticut’s Congressional representatives on Capitol Hill about federal homeless response resources. The delegation for the National Alliance on Ending Homelessness Capitol Hill Day included representatives from the Connecticut Coalition to End Homelessness, Pacific House, Inc., Journey Home, Columbus House, and Supportive Housing Works. During conversations with housing legislative staffers in the offices of both Senators and all our Congressional representatives, Team CT emphasized the fact that our housing and homeless assistance programs are effective, efficient and pivotal for continuing the progress toward ending homelessness. This year, participants focused on key priorities such as funding for HUD’s McKinney-Vento Homelessness Assistance Grants, protecting Medicaid funding, funding for rental assistance and affordable housing programs, and eliminating the sunset date for the United States Interagency Council on Homelessness (USICH). One of the key lessons from Capitol Hill Day, was that our voices are needed more than ever and it is imperative that we let Congress know how important federal funding is to ending homelessness. Please click here to raise your voice to Congress and help end homelessness.